Some people have cool jobs. And then there's Scott Maxwell, who has one of the best gigs on two planets. 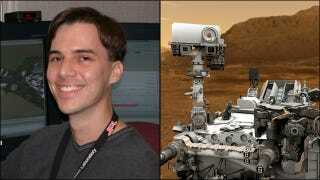 He's one of the people who drives the Curiosity Rover on Mars. How do you get that job? What's it like? And how does it compare to all the sci-fi and video game fantasies we've all had about this kind of thing? Maral Tajerian: Can you tell us how you ended up working for NASA? What is your background expertise? So I decided to get a job instead. I was scrolling through the list of interviewers, and I saw JPL (Jet Propulsion Laboratory). Being a giant space nerd, I was hugely excited. I said, "Wow, holy smoke, JPL! These are the guys who did Voyager, these are the guys who did Viking! ... Ah, they'd never want me." Maxwell: "When I was six years old, I wanted to grow up to be Luke Skywalker. (My much more clueful older brother wanted to be Han Solo, but I digress.)" I had to get pushed into going to the interview, and I went with the expectation that I wouldn't get hired, I'd just get a chance to talk to the people who were doing this exciting work. When the interviewer asked me why I wanted to work for NASA, I just lit up and started gushing about how I thought space exploration was the coolest thing ever. Little did I know that the interviewers looked for enthusiasm as much as anything else, so that scored me an on-Lab interview! Then I got very lucky, because a natural disaster happened. By total coincidence, I was brought out for an interview the day of the Northridge Quake. The woman who was interviewing me said that if I still wanted a job after that, they'd hire me. And I did, so they did. As you can tell, my personal story has a lot of luck in it. If I'd known better at the time, I'd have realized you can make your own luck: set your sights on NASA, get really good at whatever engineering or physical science you do, and NASA will make a place for you. Tajerian: What is the best part about your job? The worst? Maxwell: I come in to work, reach out my hand across a hundred million miles of emptiness, and move something on the surface of another world. I've been doing that for nearly nine years, and every day is as magical as the first. As for the worst part of my job ... I often say that the worst parts of working at JPL are exactly like the worst parts of working everywhere else. It's not that the bad parts of working at JPL are better than the bad parts of working at any other job, it's just that the good parts are better than the good parts of anything else I can imagine doing. As we say around here, when we have a product launch, we really have a product launch. Tajerian: Driving the Mars rover sounds almost like science fiction. How similar is reality to what is portrayed in scifi? Has your choice of career been influenced by your exposure to scifi? take the best possible pictures of Saturn. Maxwell: "The rovers are like smart dogs: a dog might understand 'sit' and 'stay' and 'roll over,' and our rovers understand commands like 'drive forward so many meters' or 'turn right 45 degrees' or 'turn your heaters on.'" Funny enough, though, when my life turned into science fiction, I largely lost my taste for the stuff. Now I read mainly classics—Shakespeare, Twain, Dickens. Tajerian: In many sci fi stories, a civilian lacking any type of formal training can land a plane/fix a spacecraft, etc. with minimal coaching. While that might be far-fetched, we know that human-machine interface is becoming easier to use . How user-friendly are the controls you work with? Maxwell: A random civilian lacking any formal training would find it hard to do what we do. In part that's because *any* single person would find it hard to do what we do—it's a gigantic team effort every day, and it only works because we have loads of smart people who are good at all kinds of different things. Someone with the right background in Computer Science or a related field would probably pick it up pretty quickly, though, but not nearly as quickly as in the movies. Tajerian: What does it take to drive the rover? Can anyone with the right training do it? How does one become an "expert" in something that has been done only a handful of times before? NASA's RSVP simulation program that helps rover drivers plan Curiosity's path. Maxwell: Essentially, we're building up a list of commands for the rover to carry out over one or more days. The rovers are like smart dogs: a dog might understand "sit" and "stay" and "roll over," and our rovers understand commands like "drive forward so many meters" or "turn right 45 degrees" or "turn your heaters on." Our job is to come up with a list of those commands that will make the rover do what we want. Of course, since we're not interactively commanding the rovers—light-time delays of up to 20 minutes each way make that impossible—we have to think in advance of everything that might go wrong and make sure we have some reasonable response to it. Imagine trying to precompute your car's whole path to the store: drive forward this far, turn right on to Main Street, and so on. Then imagine that the world gets to throw random obstacles in your way—a kid runs out into the middle of the street, or a tree falls across your path, or there was lots of water in the street so your car didn't go as far as it was supposed to, or whatever. Then make sure you've told your car about all of these hazards and made sure it keeps itself safe no matter what, instead of crashing into your neighbor's house. That's what driving a Mars rover is like. Anybody can in principle learn to do this, but it takes time and oh so much patience. Tajerian: In various recent publications, it was shown that experienced gamers have fast reaction times and improved executive control skills. Seeing how video games are becoming more complex and sophisticated, how close are video game controls to actual Mars Rover controls? Do you use a joystick, keyboard,etc. Maxwell: We don't drive the rovers interactively, but we drive the simulation interactively. Part of the job is getting the simulation to do the right thing so that the rover will do the right thing. Like most things you do on a computer, our primary interfaces are keyboards and mice. (We've experimented with other control schemes, such as Wiimotes and SpaceBalls, but regular keyboards and mice are the best so far.) We also have special 3-D goggles—gaming goggles, actually—that let us view the scene in true 3-D, to better understand the rover's world. Maxwell: "You have to think about what the [Curiosity simulator's] system actually does, not what the people who designed it meant for you to do with it. It's a very hacker-y way of thinking, something that many gamers would feel right at home with." The simulation is where the video gaming aspects really come in. In part, this is because it's a 3-D world, exactly like you'd see in any game. We can fly around in it, look at the world around the rover from all angles, and so on. But there's also a more subtle way in which it's like video games. Take BioShock, for example. In that game you have a variety of enhanced capabilities, and the fun of solving the game is thinking up creative ways to use those enhanced capabilities to meet your goals. In the same way, our rover-driving software is chock full of features you can use to solve problems, but you have to have a mental list of what's there and creatively bring the right features to bear on a problem of interest. That's true of the rover's command set, too. Often, there will be more than one way to solve a problem, and the fun and challenge of what we do is to think of the most elegant way to attack it. I hate to say it out loud, but the most fun happens when something goes wrong with the rover—when you get stuck in a dune, or when a wheel fails. Then you have to think creatively about how to use the system to get yourself out of that mess. The fundamental insight there is that you have to think about what the system actually does, not what the people who designed it meant for you to do with it. It's a very hacker-y way of thinking, something that many gamers would feel right at home with. Tajerian: Do you play video games? When you drive the Mars Rover, do you see any similarities to any games you've played? Maxwell: I play a fair amount, more than the other drivers, I think. I own four game consoles: a PS/3, a Wii, a GameCube, and a PS/2. Also, I've ordered an Ouya. I usually play games after everyone else in the world has played them, but I get around to them eventually. I like WWII shooters, and I've recently enjoyed the heck out of the BioShock and Uncharted series. Also anything that involves killing zombies. I can't get enough of training for the coming zombocalypse. As I said above, I think I bring my gaming skills to bear on rover driving both in direct ways (flying around in a 3-D world) and indirect ways (creative problem solving). Tajerian: What are some of the common misconceptions you've encountered in scifi media? What do you think would remedy these misconceptions? Maxwell: If I could persuade every movie director in the world to stop making sounds in space, I could die happy. Tajerian: Our zeitgeist glamorizes geekdom. Be it fashion, movies, or games, being a geek is "in". From your personal viewpoint, how true is that? Maxwell: I definitely think there's some truth to that, I'm happy to say. I grew up in the 1980s, and in my high school, you were viewed with suspicion if you owned a computer. I had more than one, so you can imagine the reactions that got. That's hard to imagine now—nowadays, I think you'd be the oddball if you *didn't* have a computer. This interview was brought to you by Maral Tajerian, Senior Partner at Thwacke! For more on science in video games, follow us @ThwackeMontreal. For more on driving Curiosity follow Scott @MarsRoverDriver. The interview was approved by NASA. Top pics: Scott Maxwell, via his Google Plus | A NASA render (not a photo!) 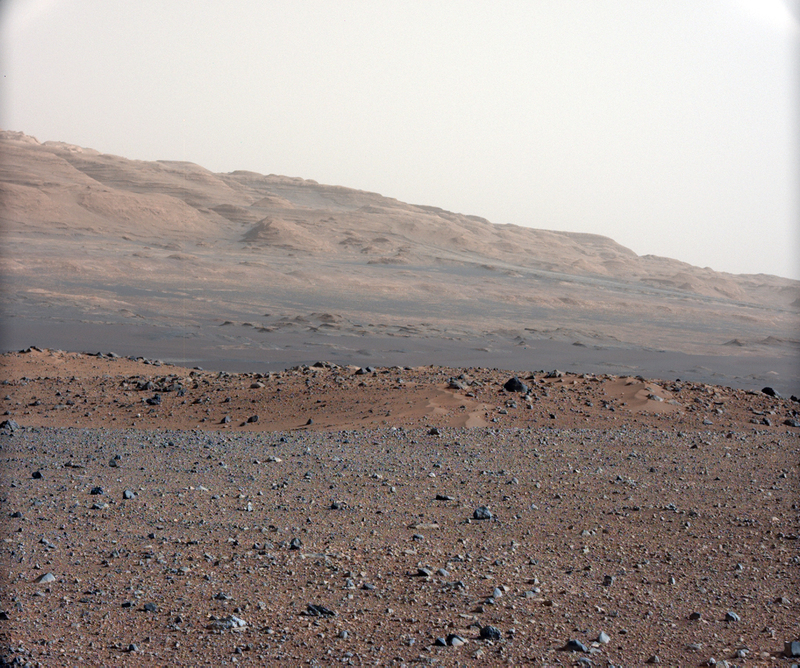 of Curiosity on Mars, via NASA.